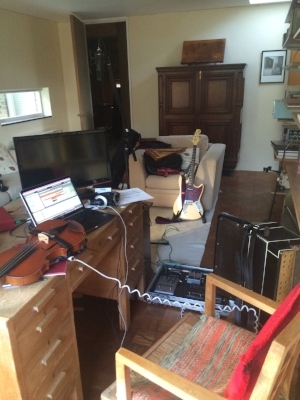 Recording in Imogen's living room/study. When I decided to work on a solo project, I knew it would be violin led and instrumental, but what would it sound like? This has been an almost two-year process, shoehorned in around two busy bands (Stick In The Wheel and Revere) plus the ‘day job’ at NMC Recordings, and all started at a residency hosted by the Britten-Pears Foundation in the former home of composer Imogen Holst in Aldeburgh, Suffolk. I created Delta entirely on violin, with my pizzicato chopped up and spread across drum sample pads, which guided me into playing patterns that wouldn’t have fallen naturally under my fingers. It was inspired by my dad’s recovery from a coma after a cardiac arrest in 2015. I’ve checked with him and he’s quite happy to be the inspiration for my debut single! As the brain fired up, his memories were replayed as if they were happening for the first time, and then filed away in the right places. In Delta I was thinking about the electrical pulses that transmit this information around the brain. At first, the memories returned slowly but then the floodgates opened. It reminded me of a TV documentary I’d seen where a dried-up river bed filled with water after a monsoon; the water found its way through all the previously carved chasms and cracks in the bed (not dissimilar to the grooves on the surface of a brain) and then into a large river. What was a traumatic time also proved to be a catalyst: themes of memory, perception, and the internal workings of the mind run through much of what I’m currently writing. For a while I got a bit obsessed with neuroscientist David Eagleman, whose books (and BBC4 TV series) are fascinating and very accessible. I’m now well on the way to finishing an album, which draws on influences of contemporary classical, folk, post-rock, and electronica. Almost every sound has been created using just the violin - sampled, processed through effects, or conventional and extended techniques. The next step is working out how to perform it all live. I'll keep you posted! Delta has been remixed by EAN (Ian Carter – Stick In The Wheel / Various Production) and Jay Chakravorty (Cajita/Bryde).